This is gorgeous, love the photo and the quote! So true Henrietta! Beautiful capture! Interesting perspective on an orchid, very subtle. 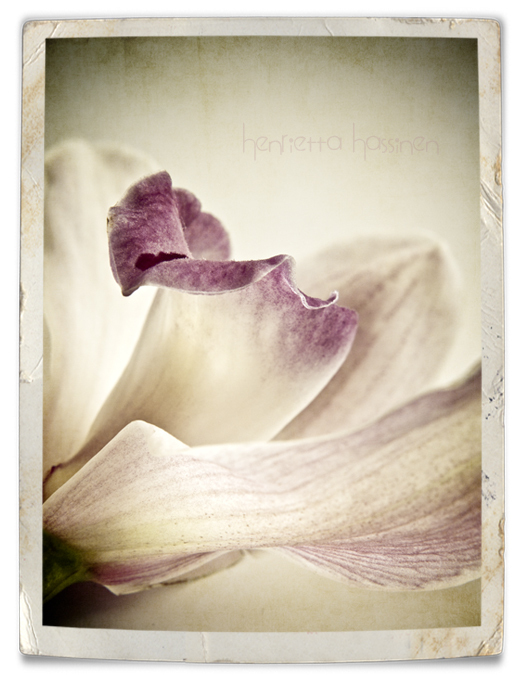 Soft and dreamy - I like your textures! I think the light must be better in Finland.. Beautiful quote and shot! I agree - great quote and beautiful image. This is stunning!!! I love how that beautiful purple stands out but doesn't distract. So beautiful! Your use of textures is amazing! Beautiful as always...so soft and pretty. I'm not usually a sensitive person, but photos of beautiful or unusual objects or people can be rather emotional. :) Love the shot. Your flower photographs speak to me. Wow, I keep on loving to visit your blog. This one so soft and gentle, it is the beauty of my Saturday, thanks. very beautiful! im loving your photography. This is absolutely gorgeous Henrietta! Just beautiful...you have such a gift. Your presentation is always just right. Have a great weekend. No midsummer celebrations for me, I have been working all weekend and still continue....but I get good money:) That is something too. I also get emotional looking at art. When we went to Italy I was so excited about seeing The David that I feared I might stand there and weep. I was overcome, but managed not to cry. I guess I must be sensitive and that's okay! Hope you are well. Lovely, lovely flower! Just det! känsliga blommor förevigade av en känslig fotograf, mycket vackert! CONGRATULATIONS Henrietta!! (Favorite Photo of the Week). So truly well-deserved with this one my friend! All the best to you and your amazing flower art <3! !